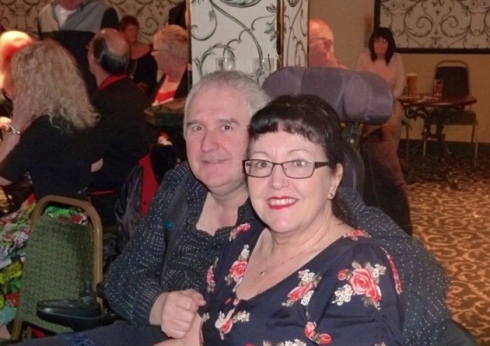 A loving wife who looks after her wheelchair-bound husband says healthcare professionals must do more to support and understand carers. Glenys Bright, 59, of Lowestoft Road, Gorleston, believes medical staff must not take for granted the health and wellbeing of people who help their family or friends on a long-term basis. Glenys, whose husband Keith, 55, suffers from multiple sclerosis (MS), wants to highlight the issue at the start of Carers Week today. Carers Week is an annual campaign to raise awareness of caring, highlight the challenges carers face, and recognise the contribution they make to families and communities throughout the UK. Glenys and Keith married in 1996. At that time Keith had already been diagnosed with MS, but his condition has deteriorated and he now relies on full-time care from Glenys and staff from Norfolk County Council on a daily basis. “Sometimes at night his legs become knotted and it’s very hard for me to untwist them. “His muscles become extremely tight. Although she is proud to care for her husband, Glenys said she feels overlooked when she and Keith visit hospital or their GP surgery for a check-up. “I seem to fade into the background, or they [the GP] think I am super-human and expect me to be able to cope with being unwell and caring at the same time,” she said. “Carers will neglect their own health if they don’t feel that the GP is listening to their needs. Keith said it was “heartbreaking” to watch the woman he loves give up other things to look after him all the time. “To see someone you care about have to drop what they’re doing to look after me makes me feel guilty,” he said. “Glenys is so important to my care. Just having company and someone to talk to is so important. Despite the difficulties that come with caring, Glenys is proud of the relationship her and Keith have built. “We care for each other, I suffer from anxiety and he helps me with that,” she said.